AWS and VMWare have made an announcement which has largely not lived up to the hype, but could be seen as a useful little addition for enterprise customers. The new partnership will aim to deliver what is described as a ‘seamlessly integrated hybrid offering’ to combine the private and public cloud offerings from the two, leaning on the hybrid cloud hysteria which has overcome the industry in recent months. AWS has largely steered clear of the hybrid cloud market to date, though it would appear CEO Andy Jassy has realized what he’s missing out with the latest move. Microsoft, IBM and Google have already been making a play for this business, and the new partnership with arguably the world leader in enterprise on-premises datacentre technology, is a useful way to make an entry. “We are excited to detail a very significant announcement that we’ve been working on for a while and we’re really thrilled that you could join us today to talk about to what we think is an industry shaping announcement,” said Pat Gelsinger, CEO of VMWare, because of course most other announcements are built around something as exciting as how Pat’s commute was in the morning or what hilarious name was written on his Starbuck’s cup. The main problem to date was a lack of a relationship between one of the world’s largest providers of public cloud platforms, and one of the world’s largest private cloud providers. To run the platform simultaneously, new software of hardware would have to be purchased and it would start to become a bit of an expensive mess. But no longer. Although it sounds like the customer’s best interests are at heart (and Telecoms.com is sure this is the case to a degree), let’s call it what it is. 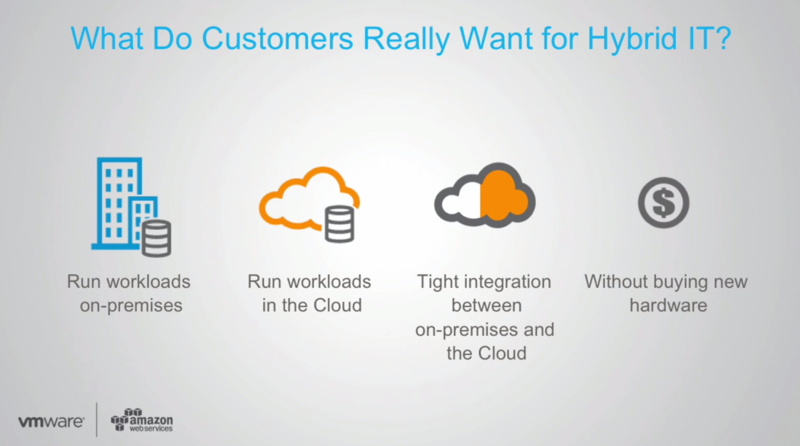 AWS wants enterprise customers to choose its platform over competitors, and aligning with the world leader in VM’s is a good way to do it in the new hybrid world, and VMWare wants to align with the world leader in public cloud so it doesn’t get left behind in the cloudification land grab. The result is VMware’s software-defined datacentre software to AWS on the ‘VMware Cloud on AWS’ tagline. VMWare’s vSphere, SAN and NSX virtualization technologies will now be available on AWS from early 2017, which will be integrated to the wider AWS offerings such as storage, database and analytics. The newly formed team made has made the video available here if you want to watch the entire announcement, though be warned, you’ll need the patience of a saint for it to work properly.